100g pack of 15 colours of plant dyed wool. 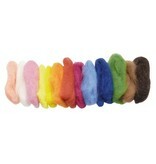 Fairy wool is useful for creating pictures, puppets and for felting. Suitable for ages 3+.